Jonah Hex has only come into my life recently, years after I first met the likes of Batman and Spider-Man, but he’s now the main reason I head to the comic shop each week. I picked up issue #50 of the current Jonah Hex series penned by Jimmy Palmiotti and Justin Grey simply because Darwin Cooke drew it, but I fell in love with the character and the rich tapestry of story of the supporting cast. I haven’t missed an issue since. I was really excited when I found out that DC had released a volume of their Showcase Presents line of trade paperbacks (their answer to Marvel’s Essentials) dedicated to ol’ Jonah. Luckily enough, a store in my area offered 30% off on trades during Free Comic Book Day, and Showcase Presents Jonah Hex Vol. 1 caught my eye almost immediately. I snatched it up and I don’t regret it. At $16.99 full cover price, it’s as affordable like any Western DVD you might find in a Cracker Barrel, and it’s just as rewarding. One of the great things about this collection is that, like the current series, almost every issue stands alone. It’s easy to imagine a little kid buying Spider-Man and Batman at the newsstand in the 1970s and then, because he has an extra quarter, snapping up Weird Western Tales because the cover shows two cowboys duking it out. Speaking of Weird Western Tales, that’s where the bulk of these stories are taken from. Jonah debuted in the pages of All-Star Western, but the book’s title was changed to Weird a few issues later, because, let’s be honest, a scarred, hateful man isn’t necessarily the first thing that comes to your mind when somebody says “The Old West.” But from his first appearance in All-Star, it’s clear that Jonah isn’t one to mess with, like any good western hero. The opening splash page of the story, “Welcome to Paradise”, shows him riding into town dragging the corpses of two dead outlaws behind him, with people surprised and shocked at his appearance. The caption even states he is a “Cold-Blooded Killer, Vicious, Unmerciful Hellion without Feeling ... A Man Consumed by Hate” and other wonderful melodramatic phrases. It’s not all hyperbole, however. A recurring theme of this book is just how fierce of a reputation Jonah has as a bounty hunter. Many of the criminals he hunts recognize him instantly and either flee in fear or bravely try to shoot him, which never works out well. Whenever he delivers those he’s captured, dead or alive, to his employers, people talk of him excitedly and in whispers, and from the way they say his name (“That’s Jonah Hex!”) tells us how much weight it carries. All this rep-building sweeps up the reader and is part of the book’s hook. The first third of the stories here play out roughly the same way: Hex is hired to fight a bad guy, he finds him, bad guy gets away due to convenience, Jonah catches him again and shoots him dead. Formulaic, but still quite satisfying. A shift occurs, however, with the story “Blood Brothers,” which interestingly enough is written by Arnold Drake, creator of the Doom Patrol! (Wonder why DC didn’t put that on the back cover blurb?) Drake's change is a visual one; whereas the earlier stories open with a splash page and then consist of 6-7 panels per page, Drake’s story has bigger and fewer panels per page, giving Tony DeZuninga (the artist for the majority of this collection) a chance to fully show some action, like a drunk getting kicked out of a saloon, or a battle between U.S. soldiers and Indian raiders. It may not be much of a change, but it stood out enough from the other stories that it made me stop and look at the page again. Beginning with “Showdown at Hard Times,” a mysterious man with an eagle-topped cane appears along with his servant Solomon, talking plans to kill Jonah. There’s also several instances where characters talk about how Jonah is a traitor to the Confederacy and caused some sort of massacre. Eventually, these two threads meet, and we learn that Jonah inadvertently led his army unit to their deaths due to the machinations of a Union general, who Hex surrenders to earlier because he’s tired of fighting to preserve something he thinks is wrong (slavery), and that one of the dead is Jeb Turnbull, the son of the man with the eagle-topped cane (we even see Jonah and Jeb give it to him as a Christmas present). This makes me wonder if the man’s full name is Quentin Turnbull, the villain in both the Six-Gun War trade and the upcoming Hex film, but it’s never stated. Regardless, it’s still mind-boggling, especially for someone born in the 1990s whose first comic subscription was to Ultimate Spider-Man, that a story arc like this is dragged out slowly, long before decompressed storytelling became the norm, but still manages to deliver a complete individual story with each part of the arc. Even more astounding is that, when you look at the table of contents, which lists the publication date for each issue, you can see that it’s a bimonthly comic. Outstanding, and it works. I mean, I love Tony Daniel’s current stuff on Batman, but he’s writing for the trade. Back then, John Albano and Michael Fleisher weren’t; they were simply telling Western stories. That’s all there was to it. There’s also another example of the simpler sort of Western stories in this book, in the form of seven tales from earlier issues of All-Star Western: four about Outlaw, a Texas ranger’s son who is framed for robbery and must clear his name, and thee about, surprisingly enough, Billy the Kid, which explore the modern-day theory that Billy was really a woman, here called Billie Joe. These two arcs, written by Robert Kanigher, are again your basic Western story, yet both are satisfying in their execution with the Outlaw eventually clearing his name and Billy escaping death respectively. Two of these stories are actually drawn by Gil Kane and they are as good as you would expect, especially some of the facial expressions Kane draws. Overall, Showcase Presents Jonah Hex is a good collection. It’s simple Western storytelling with comic book action and flair intact. Stagecoach robberies, gunfights, it’s all here. Really, the lack of color isn’t even that big of an issue, although if you want to see them that way, several of these stories were just reprinted by DC in the Jonah Hex: Welcome to Paradise trade. 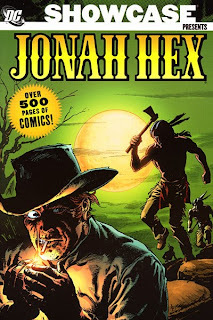 Judging by online news, it seems DC will reprint some more of this era of Jonah Hex to tie in to the upcoming film. So try this book out first; maybe you’ll feel compelled to check out some more. I know I am. Hope they release a fresh print anytime soon.